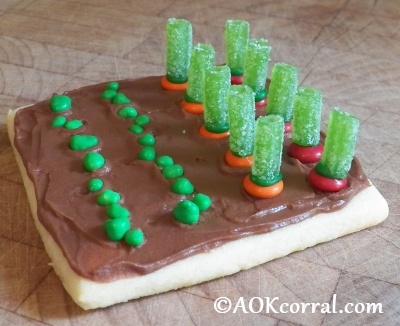 Create three different cookie gardens with candy in our summer craft project for kids. Bonus: The PDF Version is great to easily print multiple copies to use with your Church VBS, Troop or other group. Includes all instructions for this entire project without margins, ads or logos. Bonus: The PDF Version is great to easily print multiple copies to use with your church, VBS Group, Troop members or other group. In a large bowl, cream together the butter, granulated sugar and powdered sugar for 3-4 minutes, until the mixture is light and fluffy. Add the eggs one at a time, mixing well after each addition. Add vanilla extract and mix. Add one cup flour, baking powder and salt. Mix. Add remaining flour and mix just until flour is incorporated and the dough is smooth and soft. Flatten the dough into a thick disk and cover in plastic wrap. Refrigerate for at least an hour. Roll the dough out to about ¼ inch thick. Cut strips 3 inches wide, then cut strips into 3 inch sections for squares. Preheat the oven to 350 degrees F. Place the cookies on a parchment lined cookie sheet and bake for 9-11 minutes until set but not over-baked. Let the cookies cool for 1-2 minutes on the baking sheet before transferring to a wire rack to cool. Using an electric hand mixer, mix together shortening and water, gradually add cocoa powder and powdered sugar, mixing with each addition until smooth.